Ottawa – August 22, 2018 – As one of Canada’s leading unions, we certainly welcome the federal government’s declaration to reduce poverty. But, after reading the fine print, we are surprised and disappointed to find that the National Strategy on Poverty Reduction is missing a key ingredient when it comes to addressing root causes and real solutions to growing inequality. The report’s title, “Opportunity for All: Canada's First Poverty Reduction Strategy", and its stated commitment to enhancing dignity, opportunity, inclusion, security, and lasting outcomes is just the kind of idealism that is sorely needed in government, public policy, and politics in general today. And there is no question that government benefits and subsidies have an important role to play in helping reduce poverty. But “Opportunity for All” lacks moral courage when it comes to declaring solutions with structural impact; in particular, the transformative role that unions serve – and have always served – in creating economic stability for families, and a better balance between the super-rich and the rest of us. While the document claims to have consulted with “unions and labour organizations,” it fails to mention the proven correlation between greater income equality and higher levels of union density (in other words the total percent of a country’s workforce that belongs to a union). Scandinavia certainly knows this fact to be true, in that its union density and poverty rates are, respectively, some of the highest and lowest in the world. “Opportunity for All” describes the gender wage gap as something that must be tackled to reduce poverty, but it never mentions – in its 109 pages – that women in unionized workplaces earn on average $6.89/hour more than non-union women, and the wage gap between men and women is more than 13 percent greater in workplaces that don’t have a union. The strategy’s repeated kinship with the United Nations 2030 strategy, and its declared support for a “human rights-based approach to poverty reduction” is encouraging, but it doesn’t specify if that approach (and definition of human rights) includes the right to join a union. Our lack of clarity on this point comes from the federal government’s long-standing silence on the exclusion of agricultural workers from the Ontario Labour Relations Act, and the 2010 decision by the International Labour Organization (ILO, a UN agency) that farm worker exclusion is a complete violation of the UN Accord on Human Rights. Poverty reduction is one of the great causes and challenges of our time. Meeting that challenge will take true leadership, and if the federal government is sincerely committed to championing that cause it must acknowledge and embrace the fact that collective bargaining is a key part of the solution. Provinces must be reminded that they help shape our country’s international reputation and credibility on issues like human rights. And in the private-sector, the federal government must take an active role in shaping corporate behaviour by awarding public contracts only to responsible corporate actors, and organizations that demonstrate a true commitment to sustainable development. 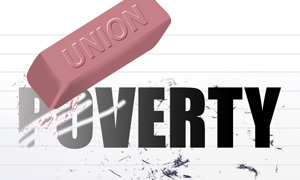 Companies found guilty of union-busting and other irresponsible behavior – that aggressively undermine poverty reduction strategies – should be automatically excluded from bidding on government contracts, and/or receiving public funds. A National Advisory Council on Poverty is an excellent idea, and the best resource for revisiting and further developing the strategies put forward to date, so long as it includes a standing place for workers and their unions, of course.